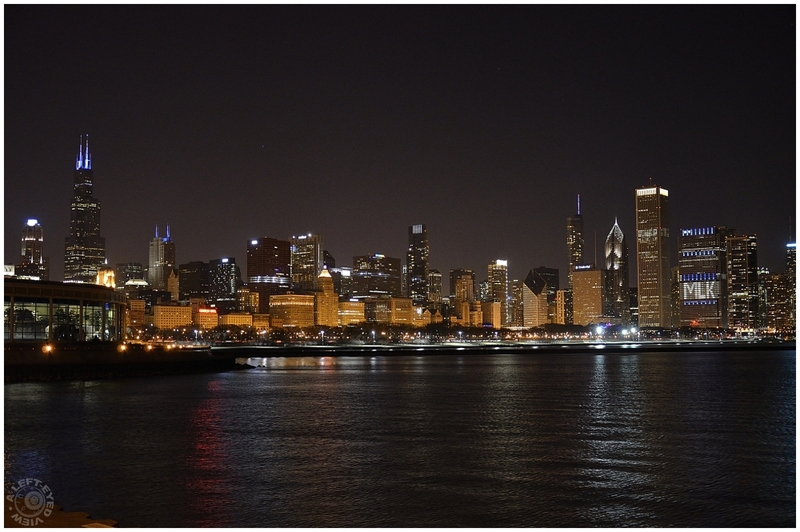 Steven (Chicagoland, United States) on 22 January 2013 in Cityscape & Urban and Portfolio. A full "reveal" of yesterday's nighttime capture of the Chicago skyline as taken from the Adler Planetarium, which incorporates Willis Tower and the John G. Shedd Aquarium on the left and Lake Michigan in the foreground. The Blue Cross/Blue Shield of Illinois Building on the right is lit up in honor of Dr. Martin L. King, Jr. As you can see, various offices of the building are all aglow on multiple levels to spell out "MLK" in his honor. Photo captured January 19, 2013. Like a mirage on the horizon - your long view from across the water is sensational! I like this panoramic view..
what a waterfront ... i guess only nyc and perhaps hong kong can rival this view !!! Wow... A perfection of the cityscape ! Such a great nighttime shot of the city, Steven - this is certainly worthy of hanging on the wall. Well done! A gorgeous night shot filled with big city excitement and pizazz ! Another one! Wonderful and perfect night shot! I like the good quality. Thank you for your infos about D7000! Another breathtaking panorama of Chicago. The crispness and the palette of lights make both for a wonderful photograph! Perfect framing and super clarity. Well, I do like the Hancock visible at the left, but yesterday's shot had more punch. Splendide paysage urbain avec ces lumières nocturnes! Absolutely beautiful! A gorgeous view of the skyline. Simply gorgeous! It's really a nice remembrance of Dr. King and a most beautiful cityscape.